It was a tortuous search for the fruit of the womb for a Nasarawa State- born couple, Shedrack and Mercy Audu. For 17 years, they ran from pillar to post, seeking medical and divine solutions to their childlessness after tying the nuptial not in 1998. On November 7, 2016, God answered their supplications and blessed them with a set of twins, a boy and a girl, whom they christened Joseph and Philomena. Expectedly, their birth instantly wiped off their tears and pain they suffered for almost two decades, as they savoured the glory of God wherever they went. “My twins were born on November 7, 2016, and they died on April 17, 2017. I met my wife who is of Eggon extraction from Akwanga Local Government Area of Nasarawa State, in 1998 at the University of Jos where I was studying for my Master’s degree in Business Management; she was a student in the Theatre Arts department. We dated for a year and got married. Three years after our marriage, there was no pregnancy and we became worried; we visited Dalhatu Specialist Hospital for medical checkup and after a detailed examination, it was discovered that she did an abortion in 1997 through a quack doctor, which affected her womb. “From that time till 2016, we were in and out of the hospital trying to see how she could conceive to no avail. We were initially afraid that once she reached menopause, it would be a big problem; she suggested we go for in-vitro fertilization (IVF-test tube) where the eggs and sperm are fertilized outside the womb into test tube, but I disagreed. We remained faithful to God until February 2016, when she conceived naturally and delivered through caesarian operation. We were extremely happy, but God has taken them away”, he lamented. 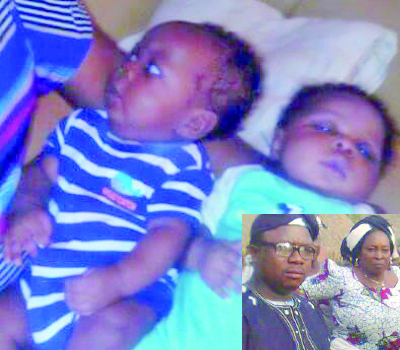 Shedrack, who hails from Lafia Local Government Area of Nasarawa State, also gave graphic details of the fatal crash, which claimed his babies. “As we were approaching Daudu in Guma Local Government Area of Benue State, a fully loaded 911 truck was dodging a pothole at the time our car was also negotiating to dodge it; the truck rammed into our car. My wife was carrying our female baby, Philomina, while I lapped the male, Joseph; they died instantly as they were badly hit by fragments of the crushed car; the driver and four other passengers also died on the spot, while my wife and I sustained injuries. We were taken to the Daudu General Hospital unconscious, but my twin babies who died instantly were taken to Lafia and buried by my younger brother who was contacted through my telephone”. Checks indicated that Shedrack’s fate had befallen many others who had lost loved ones on the terribly bad Lafia-Makurdi highway. It is a nightmare for commuters plying the road, as auto crashes are recorded almost daily. Within the past two months alone, no fewer than 47 lives were lost while 42 others sustained injuries in 21 incidents, according to available statistics. Barely a week before the accident which involved Shedrack’s family, the driver and entire passengers in a 14-seater commuter bus perished when a trailer conveying livestock rammed into their vehicle. The accident occurred less than one hour after the Abuja bound bus departed Makurdi on April 8, 2017. Four weeks later, a 16-year-old girl, Fatima Usman, whose father died in a crash on the road in 2001 when she was barely two weeks old, lost her mum on the same spot, which claimed her dad. Apart from her mother, Fatima lost three other members of her family, including her grandfather, aunt, and a cousin. She was the only survivor of the crash, which occurred on May 9, 2017, while they were travelling to Makurdi to attend a naming. Sadly, Fatima is the only child of her late parents, now left alone in a daily battle for survival. “I remember everything that happened on that ill-fated day”, she told our correspondent in an emotion-laden voice; “I remember crawling out of the vehicle with deep cuts on my knees, I remember my aunt screaming my mum’s name and she wasn’t answering; I remember pulling out my mobile phone and calling a neighbour in Lafia to inform him of what had happened; we were taken to General Hospital Gbajumba in Guma Local Government Area of Benue State, where my mum, aunt, cousin and grandfather, all died, except me. I’ve been diagnosed of post traumatic stress disorder. I don’t know what to do. Friday, June 16, 2017 was my mum’s birthday, and I spent the whole day crying”, Fatima, an SS3 student of Government Science Secondary School, Lafia, lamented.